For other uses, see Adam and Eve (disambiguation). Adam and Eve, according to the creation myth of the Abrahamic religions, were the first man and woman. They are central to the belief that humanity is in essence a single family, with everyone descended from a single pair of original ancestors. It also provides the basis for the doctrines of the fall of man and original sin that are important beliefs in Christianity, although not held in Judaism or Islam. In the Book of Genesis of the Hebrew Bible, chapters one through five, there are two creation narratives with two distinct perspectives. In the first, Adam and Eve are not named. Instead, God created humankind in God's image and instructed them to multiply and to be stewards over everything else that God had made. In the second narrative, God fashions Adam from dust and places him in the Garden of Eden. Adam is told that he can eat freely of all the trees in the garden, except for a tree of the knowledge of good and evil. Subsequently, Eve is created from one of Adam's ribs to be Adam's companion. They are innocent and unembarrassed about their nakedness. However, a serpent deceives Eve into eating fruit from the forbidden tree, and she gives some of the fruit to Adam. These acts give them additional knowledge, but it gives them the ability to conjure negative and destructive concepts such as shame and evil. God later curses the serpent and the ground. God prophetically tells the woman and the man what will be the consequences of their sin of disobeying God. Then he banishes them from the Garden of Eden. Adam and Eve are figures from the primeval history (Genesis 1 to 11), the Bible's mythic history of the first years of the world's existence. The History tells how God creates the world and all its beings and places the first man and woman (Adam and Eve) in his Garden of Eden, how the first couple are expelled from God's presence, of the first murder which follows, and God's decision to destroy the world and save only the righteous Noah and his sons; a new humanity then descends from these sons and spreads throughout the world. Although the new world is as sinful as the old, God has resolved never again to destroy the world by flood, and the History ends with Terah, the father of Abraham, from whom will descend God's chosen people, the Israelites. Adam and Eve are the Bible's first man and first woman. Adam's name appears first in Genesis 1 with a collective sense, as "mankind"; subsequently in Genesis 2-3 it carries the definite article ha, equivalent to English "the", indicating that this is "the man". In these chapters God fashions "the man" (ha adam) from earth (adamah), breathes life into his nostrils, and makes him a caretaker over creation. God next creates for the man an ezer kenegdo, a "helper corresponding to him", from his side or rib. She is called ishsha, "woman", because, the text says, she is formed from ish, "man". The man receives her with joy, and the reader is told that from this moment a man will leave his parents to "cling" to a woman, the two becoming one flesh. The first man and woman are in God's Garden of Eden, where all creation is vegetarian and there is no violence. They are permitted to eat of all the trees except one, the tree of the knowledge of good and evil. The woman is tempted by a talking serpent to eat the forbidden fruit, and gives some to the man, who eats also. (Contrary to popular myth she does not beguile the man, who appears to have been present at the encounter with the serpent). God curses all three, the man to a lifetime of hard labour followed by death, the woman to the pain of childbirth and to subordination to her husband, and the serpent to go on his belly and suffer the enmity of both man and woman. God then clothes the nakedness of the man and woman, who have become god-like in knowing good and evil, then banishes them from the garden lest they eat the fruit of a second tree, the tree of life, and live forever. The story continues in Genesis 3 with the "expulsion from Eden" narrative. A form analysis of Genesis 3 reveals that this portion of the story can be characterized as a parable or "wisdom tale" in the wisdom tradition. The poetic addresses of the chapter belong to a speculative type of wisdom that questions the paradoxes and harsh realities of life. This characterization is determined by the narrative's format, settings, and the plot. The form of Genesis 3 is also shaped by its vocabulary, making use of various puns and double entendres. The expulsion from Eden narrative begins with a dialogue between the woman and a serpent, identified in Genesis 3:1 as an animal that was more crafty than any other animal made by God, although Genesis does not identify the serpent with Satan. :16 The woman is willing to talk to the serpent and respond to the creature's cynicism by repeating God's prohibition against eating fruit from the tree of knowledge (Genesis 2:17). The woman is lured into dialogue on the serpent's terms which directly disputes God's command. The serpent assures the woman that God will not let her die if she ate the fruit, and, furthermore, that if she ate the fruit, her "eyes would be opened" and she would "be like God, knowing good and evil" (Genesis 3:5). The woman sees that the fruit of the tree of knowledge is a delight to the eye and that it would be desirable to acquire wisdom by eating the fruit. The woman eats the fruit and gives some to the man (Genesis 3:6). With this the man and woman recognize their own nakedness, and they make loincloths of fig leaves (Genesis 3:7). In the next narrative dialogue, God questions the man and the woman (Genesis 3:8–13), and God initiates a dialogue by calling out to the man with a rhetorical question designed to consider his wrongdoing. The man explains that he hid in the garden out of fear because he realized his own nakedness (Genesis 3:10). This is followed by two more rhetorical questions designed to show awareness of a defiance of God's command. The man then points to the woman as the real offender, and he implies that God is responsible for the tragedy because the woman was given to him by God (Genesis 3:12). God challenges the woman to explain herself, and she shifts the blame to the serpent (Genesis 3:13). Divine pronouncement of three judgments are then laid against all the culprits, Genesis 3:14–19. A judgement oracle and the nature of the crime is first laid upon the serpent, then the woman, and, finally, the man. On the serpent, God places a divine curse. The woman receives penalties that impact her in two primary roles: she shall experience pangs during childbearing, pain during childbirth, and while she shall desire her husband, he will rule over her. The man's penalty results in God cursing the ground from which he came, and the man then receives a death oracle, although the man has not been described, in the text, as immortal. :18; Abruptly, in the flow of text, in Genesis 3:20, the man names the woman "Eve" (Heb. hawwah), "because she was the mother of all living". God makes skin garments for Adam and Eve (Genesis 3:20). The chiasmus structure of the death oracle given to Adam in Genesis 3:19, is a link between man's creation from "dust" (Genesis 2:7) to the "return" of his beginnings:" you return, to the ground, since from it you were taken, for dust you are, and to dust, you will return." The garden account ends with an intradivine monologue, determining the couple's expulsion, and the execution of that deliberation (Genesis 3:22–24}. The reason given for the expulsion was to prevent the man from eating from the tree of life and becoming immortal: "Behold, the man is become as one of us, to know good and evil; and now, lest he put forth his hand, and take also of the tree of life, and eat, and live for ever" (Genesis 3:22). :18; God exiles Adam and Eve from the Garden and installs cherubs (supernatural beings that provide protection) and the "ever-turning sword" to guard the entrance (Genesis 3:24). Genesis 4 narrates life outside the garden, including the birth of Adam and Eve's first children Cain and Abel and the story of the first murder. A third son, Seth, is born to Adam and Eve, and Adam had "other sons and daughters" (Genesis 5:4). Genesis 5 lists Adam's descendants from Seth to Noah with their ages at the birth of their first sons and their ages at death. Adam's age at death is given as 930 years. According to the Book of Jubilees, Cain married his sister Awan, a daughter of Adam and Eve. The Primeval History forms the opening chapters of the Torah, the five books making up the history of the origins of Israel. This achieved something like its current form in the 5th century BCE, but Genesis 1-11 shows little relationship to the rest of the Bible: for example, the names of its characters and its geography - Adam (man) and Eve (life), the Land of Nod ("Wandering"), and so on - are symbolic rather than real, and almost none of the persons, places and stories mentioned in it are ever met anywhere else. This has led scholars to suppose that the History forms a late composition attached to Genesis and the Pentateuch to serve as an introduction. Just how late is a subject for debate: at one extreme are those who see it as a product of the Hellenistic period, in which case it cannot be earlier than the first decades of the 4th century BCE; on the other hand the Yahwist source has been dated by some scholars, notably John Van Seters, to the exilic pre-Persian period (the 6th century BCE) precisely because the Primeval History contains so much Babylonian influence in the form of myth. [Note 1] The Primeval History draws on two distinct "sources", the Priestly source and what is sometimes called the Yahwist source and sometimes simply the "non-Priestly"; for the purpose of discussing Adam and Eve in the Book of Genesis the terms "non-Priestly" and "Yahwist" can be regarded as interchangeable. Certain concepts, such as the serpent being identified as Satan, Eve being a sexual temptation, or Adam's first wife being Lilith, come from literary works found in various Jewish apocrypha, but they are not found anywhere in the Book of Genesis or the Torah itself. Writings dealing with these subjects are extant literature in Greek, Latin, Slavonic, Syriac, Armenian, and Arabic, extending back to ancient Jewish thought. The concepts are not part of Rabbinic Judaism, but they did influence Christian theology, and this marks a radical split between the two religions. Some of the oldest Jewish portions of apocrypha are called Primary Adam Literature where some works became Christianized. Examples of Christianized works are Life of Adam and Eve, Conflict of Adam and Eve with Satan and an original Syriac work entitled Cave of Treasures which has close affinities to the Conflict as noted by August Dillmann. Some modern scholars, such as James Barr, Moshe Greenberg, and Michael Fishbane, see the story of Adam and Eve as a representation of a rise to moral agency, at least as much as, if not more than the story of a fall from grace. Carol Meyers and Bruce Naidoff view the tale as an explanation of agricultural conditions in the highlands of Canaan. For the Jewish Weekly Torah portion, see Bereshit (parsha) § Third reading, and Bereshit (parsha) § Fourth reading. It was also recognized in ancient Judaism, that there are two distinct accounts for the creation of man. The first account says "male and female [God] created them", implying simultaneous creation, whereas the second account states that God created Eve subsequent to the creation of Adam. The Midrash Rabbah – Genesis VIII:1 reconciled the two by stating that Genesis one, "male and female He created them", indicates that God originally created Adam as a hermaphrodite, bodily and spiritually both male and female, before creating the separate beings of Adam and Eve. Other rabbis suggested that Eve and the woman of the first account were two separate individuals, the first being identified as Lilith, a figure elsewhere described as a night demon. According to traditional Jewish belief, Adam and Eve are buried in the Cave of Machpelah, in Hebron. In Reform Judaism, Harry Orlinsky analyzes the Hebrew word nefesh in Genesis 2:7 where "God breathes into the man's nostrils and he becomes nefesh hayya." Orlinsky argues that the earlier translation of the phrase "living soul" is incorrect. He points out that "nefesh" signifies something like the English word "being", in the sense of a corporeal body capable of life; the concept of a "soul" in the modern sense, did not exist in Hebrew thought until around the 2nd century B.C., when the idea of a bodily resurrection gained popularity. 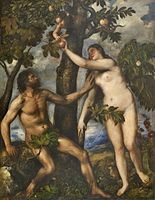 Some early fathers of the Christian church held Eve responsible for the Fall of man and all subsequent women to be the first sinners because Eve tempted Adam to commit the taboo. "You are the devil's gateway" Tertullian told his female readers, and went on to explain that they were responsible for the death of Christ: "On account of your desert [i.e., punishment for sin, that is, death], even the Son of God had to die." In 1486, the Dominicans Kramer and Sprengler used similar tracts in Malleus Maleficarum ("Hammer of Witches") to justify the persecution of "witches". Medieval Christian art often depicted the Edenic Serpent as a woman (often identified as Lilith), thus both emphasizing the serpent's seductiveness as well as its relationship to Eve. Several early Church Fathers, including Clement of Alexandria and Eusebius of Caesarea, interpreted the Hebrew "Heva" as not only the name of Eve, but in its aspirated form as "female serpent." Based on the Christian doctrine of the Fall of man, came the doctrine of original sin. St Augustine of Hippo (354–430), working with a Latin translation of the Epistle to the Romans, interpreted the Apostle Paul as having said that Adam's sin was hereditary: "Death passed upon [i.e., spread to] all men because of Adam, [in whom] all sinned", Romans 5:12 Original sin became a concept that man is born into a condition of sinfulness and must await redemption. This doctrine became a cornerstone of Western Christian theological tradition, however, not shared by Judaism or the Orthodox churches. Over the centuries, a system of unique Christian beliefs had developed from these doctrines. Baptism became understood as a washing away of the stain of hereditary sin in many churches, although its original symbolism was apparently rebirth. Additionally, the serpent that tempted Eve was interpreted to have been Satan, or that Satan was using a serpent as a mouthpiece, although there is no mention of this identification in the Torah and it is not held in Judaism. 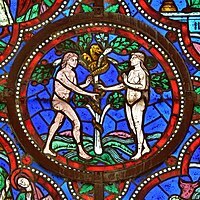 Conservative Protestants typically interpret Genesis 3 as defining humanity's original parents as Adam and Eve who disobeyed God's prime directive that they were not to eat "the fruit of the tree of the knowledge of good and evil" (NIV). When they disobeyed, they committed a major transgression against God and were immediately punished, which led to "the fall" of humanity. Thus, sin and death entered the universe for the first time. Adam and Eve were ejected from the Garden of Eden, never to return. Gnostic Christianity discussed Adam and Eve in two known surviving texts, namely the "Apocalypse of Adam" found in the Nag Hammadi documents and the "Testament of Adam". The creation of Adam as Protoanthropos, the original man, is the focal concept of these writings. Another Gnostic tradition held that Adam and Eve were created to help defeat Satan. The serpent, instead of being identified with Satan, is seen as a hero by the Ophites. Still other Gnostics believed that Satan's fall, however, came after the creation of humanity. As in Islamic tradition, this story says that Satan refused to bow to Adam due to pride. Satan said that Adam was inferior to him as he was made of fire, whereas Adam was made of clay. This refusal led to the fall of Satan recorded in works such as the Book of Enoch. In Islam, Adam (Ādam; Arabic: آدم‎), whose role is being the father of humanity, is looked upon by Muslims with reverence. Eve (Ḥawwāʼ; Arabic: حواء ) is the "mother of humanity". The creation of Adam and Eve is referred to in the Qurʼān, although different Qurʼanic interpreters give different views on the actual creation story (Qurʼan, Surat al-Nisaʼ, verse 1). In al-Qummi's tafsir on the Garden of Eden, such place was not entirely earthly. According to the Qurʼān, both Adam and Eve ate the forbidden fruit in a Heavenly Eden. As a result, they were both sent down to Earth as God's representatives. Each person was sent to a mountain peak: Adam on al-Safa, and Eve on al-Marwah. In this Islamic tradition, Adam wept 40 days until he repented, after which God sent down the Black Stone, teaching him the Hajj. According to a prophetic hadith, Adam and Eve reunited in the plain of ʻArafat, near Mecca. They had two sons together, Qabil and Habil. There is also a legend of a younger son, named Rocail, who created a palace and sepulcher containing autonomous statues that lived out the lives of men so realistically they were mistaken for having souls. The concept of "original sin" does not exist in Islam, because according to Islam Adam and Eve were forgiven by God. When God orders the angels to bow to Adam, Iblīs questioned, "Why should I bow to man? I am made of pure fire and he is made of soil." The liberal movements within Islam have viewed God's commanding the angels to bow before Adam as an exaltation of humanity, and as a means of supporting human rights; others view it as an act of showing Adam that the biggest enemy of humans on earth will be their ego. In Swahili literature, Eve ate from the forbidden tree, thus causing her expulsion, after being tempted by Iblis. Thereupon, Adam heroically eats from the forbidden fruit in order to follow Eve and protect her on earth. 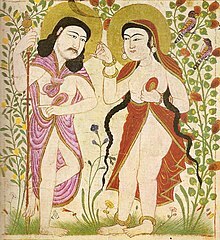 In the Bahá'í Faith, the Adam and Eve narrative is seen as symbolic. In Some Answered Questions, 'Abdu'l-Bahá rejects a literal reading and states that the story contains "divine mysteries and universal meanings". 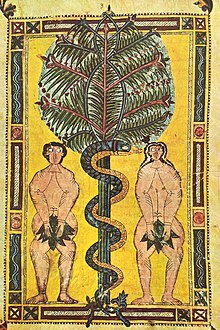 Adam symbolizes the "heavenly spirit", Eve symbolizes the "human soul", the Tree of Knowledge symbolizes "the human world", and the serpent symbolizes "attachment to the human world". The fall of Adam thus represents the way humanity became conscious of good and evil. In another sense, Adam and Eve represent God's Will and Determination, the first two of the seven stages of Divine Creative Action. While a traditional view was that the Book of Genesis was authored by Moses and has been considered historical and metaphorical, modern scholars consider the Genesis creation narrative as one of various ancient origin myths. Analysis like the documentary hypothesis also suggests that the text is a result of the compilation of multiple previous traditions, explaining apparent contradictions. Other stories of the same canonical book, like the Genesis flood narrative, are also understood as having been influenced by older literature, with parallels in the older Epic of Gilgamesh. With scientific developments in paleontology, geology, biology and other disciplines, it was discovered that humans, and all other living things, share the same common ancestor which evolved through natural processes, over billions of years to form the life we see today. In biology the most recent common ancestors, when traced back using the Y-chromosome for the male lineage and mitochondrial DNA for the female lineage, are commonly called the Y-chromosomal Adam and Mitochondrial Eve, respectively. These do not fork from a single couple at the same epoch even if the names were borrowed from the Tanakh. John Milton's Paradise Lost, a famous 17th-century epic poem written in blank verse, explores and elaborates upon the story of Adam and Eve in great detail. As opposed to the Biblical Adam, Milton's Adam is given a glimpse of the future of mankind, by the archangel Michael, before he has to leave Paradise. American painter Thomas Cole painted The Garden of Eden (1828), with lavish detail of the first couple living amid waterfalls, vivid plants, and attractive deer. Mark Twain wrote humorous and satirical diaries for Adam and Eve in both Eve's Diary (1906) and The Private Life of Adam and Eve (1931), posthumously published. C. L. Moore's 1940 story Fruit of Knowledge is a re-telling of the Fall of Man as a love triangle between Lilith, Adam and Eve – with Eve's eating the forbidden fruit being in this version the result of misguided manipulations by the jealous Lilith, who had hoped to get her rival discredited and destroyed by God and thus regain Adam's love. In Stephen Schwartz's musical Children of Eden, "Father" (God) creates Adam and Eve at the same time and considers them His children. They even assist Him in naming the animals. 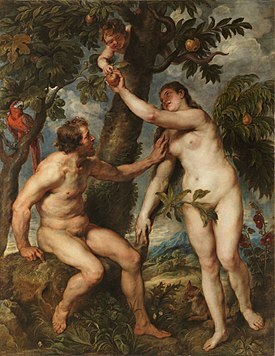 When Eve is tempted by the serpent and eats the forbidden fruit, Father makes Adam choose between Him and Eden, or Eve. 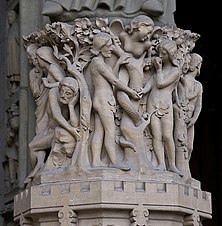 Adam chooses Eve and eats the fruit, causing Father to banish them into the wilderness and destroying the Tree of Knowledge, from which Adam carves a staff. Eve gives birth to Cain and Abel, and Adam forbids his children from going beyond the waterfall in hopes Father will forgive them and bring them back to Eden. When Cain and Abel grow up, Cain breaks his promise and goes beyond the waterfall, finding the giant stones made by other humans, which he brings the family to see, and Adam reveals his discovery from the past: during their infancy, he discovered these humans, but had kept it secret. He tries to forbid Cain from seeking them out, which causes Cain to become enraged and he tries to attack Adam, but instead turns his rage to Abel when he tries to stop him and kills him. Later, when an elderly Eve tries to speak to Father, she tells how Adam continually looked for Cain, and after many years, he dies and is buried underneath the waterfall. Eve also gave birth to Seth, which expanded hers and Adam's generations. Finally, Father speaks to her to bring her home. Before she dies, she gives her blessings to all her future generations, and passes Adam's staff to Seth. Father embraces Eve and she also reunited with Adam and Abel. Smaller casts of the American version usually have the actors cast as Adam and Eve double as Noah and Mama Noah. 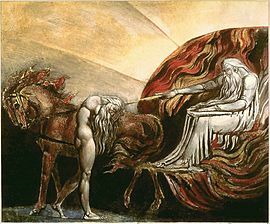 In Ray Nelson's novel Blake's Progress the poet William Blake and his wife Kate travel to the end of time where the demonic Urizen offers them his own re-interpretation of the Biblical story: "In this painting you see Adam and Eve listening to the wisdom of their good friend and adviser, the serpent. One might even say he was their Savior. He gave them freedom, and he would have given them eternal life if he'd been allowed to." John William "Uncle Jack" Dey painted "Adam and Eve Leave Eden" (1973), using stripes and dabs of pure color to evoke Eden's lush surroundings. In C.S. Lewis' science fiction novel "Perelandra", the story of Adam and Eve is re-enacted on the Planet Venus - but with a different ending. A green-skinned pair, who are destined to be the ancestors of Venusian humanity, are living in naked innocence on wonderful floating islands which are the Venusian Eden; a demonically-possessed Earth scientist arrives in a spaceship, acting the part of the snake and trying to tempt the Venusian Eve into disobeying God; but the protagonist, Cambridge scholar Ransom, succeeds in thwarting him - so that Venusian humanity will have a glorious future, free of Original Sin. ^ See John Van Seters, Prologue to History: The Yahwist as Historian in Genesis (1992), pp.80, 155-156. ^ Womack, Mari (2005). Symbols and Meaning: A Concise Introduction. Walnut Creek ... [et al. ]: Altamira Press. p. 81. ISBN 0759103224. Retrieved 16 August 2013. Creation myths are symbolic stories describing how the universe and its inhabitants came to be. Creation myths develop through oral traditions and therefore typically have multiple versions. ^ Leeming, David (2010). Creation Myths of the World: Parts I-II. p. 303. ^ Azra, Azyumardi (2009). "Chapter 14. Trialogue of Abrahamic Faiths: Towards an Alliance of Civilizations". In Ma'oz, Moshe. The Meeting of Civilizations: Muslim, Christian, and Jewish. Eastbourne: Sussex Academic Press. pp. 220–229. ISBN 978-1-845-19395-9. ISBN 1-84519395-4. ^ Alfred J., Kolatch (1985). The Second Jewish Book of Why (2nd, revised ed.). New York City: Jonathan David Publishers. p. 64. ISBN 978-0-824-60305-2. Excerpt in Judaism's Rejection Of Original Sin. ^ Blenkinsopp 2011, p. ix. ^ Blenkinsopp 2011, p. 1. ^ a b c Hearne 1990, p. 9. ^ a b c d e f g Galambush 2000, p. 436. ^ Alter 2008, p. 27-28. ^ Freedman, Meyers, Patrick (1983). Carol L. Meyers; Michael Patrick O'Connor; David Noel Freedman, eds. The Word of the Lord Shall Go Forth: Essays in Honor of David Noel Freedman. Eisenbrauns. pp. 343–344. ISBN 9780931464195. ^ a b c Levenson, Jon D. (2004). "Genesis: Introduction and Annotations". In Berlin, Adele; Brettler, Marc Zvi. The Jewish Study Bible. Oxford University Press. ISBN 9780195297515. ^ Addis, Edward (1893). The Documents of the Hexateuch, Volume 1. Putnam. pp. 4–7. ^ Weinstein, Brian (2010). 54 Torah Talks: From Layperson to Layperson. iUniverse. p. 4. ISBN 9781440192555. ^ Betsy Halpern Amaru (1999). The Empowerment of Women in the Book of Jubilees, p. 17. ^ Enns 2012, p. 5. ^ Sailhamer 2010, p. 301 and fn.35. ^ a b Blenkinsopp 2011, p. 2. ^ Sailhamer 2010, p. 301. ^ Gmirkin 2006, p. 240-241. ^ Gmirkin 2006, p. 6. ^ Carr 2000, p. 492. ^ First translated by August Dillmann (Das christl. Adambuch des Morgenlandes, 1853), and the Ethiopic book first edited by Trump (Abh. d. Münch. Akad. xv., 1870–1881). ^ Die Schatzhöhle translated by Carl Bezold from three Syriac MSS (1883), edited in Syriac (1888). ^ "Tertullian, "De Cultu Feminarum", Book I Chapter I, ''Modesty in Apparel Becoming to Women in Memory of the Introduction of Sin Through a Woman'' (in "The Ante-Nicene Fathers")". Tertullian.org. Retrieved 2014-02-17. ^ Fox, Robin Lane (2006) . The Unauthorized Version: Truth and Fiction in the Bible. Penguin Books Limited. pp. 15–27. ISBN 9780141925752. ^ Historical Dictionary of Prophets in Islam and Judaism, Wheeler, "Adam and Eve"
^ Mecca and Eden: Ritual, Relics, and Territory in Islam – Brannon M. Wheeler – Google Books. Books.google.com.qa. July 2006. ISBN 9780226888040. Retrieved 17 February 2014. ^ Godwin, William (1876). Lives of the Necromancers. Chatto and Windus. pp. 112–113. Archived from the original on 12 June 2009. Retrieved 29 January 2019. ^ Sours, Michael (2001). The Tablet of the Holy Mariner: An Illustrated Guide to Baha'u'llah's Mystical Work in the Sufi Tradition. Los Angeles: Kalimát Press. p. 86. ISBN 1-890688-19-3. ^ Some Answered Questions: Adam and Eve. 'Abdu'l-Bahá. ^ Momen, Wendy (1989). A Basic Bahá'í Dictionary. Oxford, UK: George Ronald. p. 8. ISBN 0-85398-231-7. ^ McLean, Jack (1997). Revisioning the Sacred: New Perspectives on a Bahá'í Theology – Volume 8. p. 215. ^ Smith, Peter (2000). "Adam". A concise encyclopedia of the Bahá'í Faith. Oxford: Oneworld Publications. p. 23. ISBN 1-85168-184-1. ^ Saiedi, Nader (2008). Gate of the Heart. Waterloo, ON: Wilfrid Laurier University Press. p. 204. ISBN 978-1-55458-035-4. ^ Van Seters, John (1998). "The Pentateuch". In Steven L. McKenzie, Matt Patrick Graham. The Hebrew Bible Today: An Introduction to Critical Issues. Westminster John Knox Press. p. 5. ISBN 9780664256524. ^ Davies, G.I (1998). "Introduction to the Pentateuch". In John Barton. Oxford Bible Commentary. Oxford University Press. p. 37. ISBN 9780198755005. ^ Gooder, Paula (2000). The Pentateuch: A Story of Beginnings. T&T Clark. pp. 12–14. ISBN 9780567084187. ^ Van Seters, John (2004). The Pentateuch: A Social-science Commentary. Continuum International Publishing Group. pp. 30–86. ISBN 9780567080882. ^ Finkel, Irving (2014). The Ark Before Noah. UK: Hachette. p. 88. ISBN 9781444757071. ^ Kampourakis, Kostas (2014). Understanding Evolution. Cambridge; New York: Cambridge University Press. pp. 127–129. ISBN 978-1-107-03491-4. LCCN 2013034917. OCLC 855585457. ^ Schopf, J. William; Kudryavtsev, Anatoliy B.; Czaja, Andrew D.; Tripathi, Abhishek B. (October 5, 2007). "Evidence of Archean life: Stromatolites and microfossils". Precambrian Research. Amsterdam, the Netherlands: Elsevier. 158 (3–4): 141–155. Bibcode:2007PreR..158..141S. doi:10.1016/j.precamres.2007.04.009. ISSN 0301-9268. ^ Takahata, N (January 1993). "Allelic genealogy and human evolution". Mol. Biol. Evol. 10 (1): 2–22. doi:10.1093/oxfordjournals.molbev.a039995. PMID 8450756. ^ "Adam and Eve Leave Eden". Smithsonian American Art Museum. Retrieved 11 February 2014. Alter, Robert (2004). The Five Books of Moses. W. W. Norton & Company. ISBN 0-393-33393-0. Blenkinsopp, Joseph (2011). Creation, Un-creation, Re-creation: A Discursive Commentary on Genesis 1-11. A&C Black. ISBN 978-0-567-37287-1. Galambush, Julie (2000). "Eve". In Freedman, David Noel; Myers, Allen C. Eerdmans Dictionary of the Bible. Amsterdam University Press. ISBN 9789053565032. Greenblatt, Stephen (2017). The Rise and Fall of Adam and Eve. New York: W. W. Norton. ISBN 978-0-393-24080-1. Hearne, Stephen Z. (1990). "Adam". In Mills, Watson E.; Bullard, Roger Aubrey. Mercer Dictionary of the Bible. Mercer University Press. ISBN 9780865543737. Hendel, Ronald S (2000). "Adam". In David Noel Freedman. Eerdmans Dictionary of the Bible. Amsterdam University Press. ISBN 9789053565032. Kissling, Paul (2004). Genesis, Volume 1. College Press. ISBN 978-0899008752. Patai, R. The Jewish Alchemists, Princeton University Press, 1994. Look up adam and eve in Wiktionary, the free dictionary. 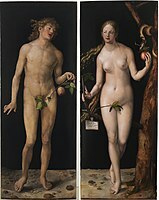 Wikimedia Commons has media related to Adam and Eve.